Ireland is divided between the largely Catholic south, which eventually gained independence from Britain, and Ulster in the north. Many in Ulster’s Protestant community have worked to remain part of the United Kingdom. Since the mid-1960s there has been much violence in Ulster between nationalists pushing for a united Ireland under Home Rule, and the extreme Protestant community. This mural in Belfast is a tribute to the Ulster Volunteer Force (UVF), a paramilitary group formed in 1966 to combat what it saw as growing Irish nationalism. 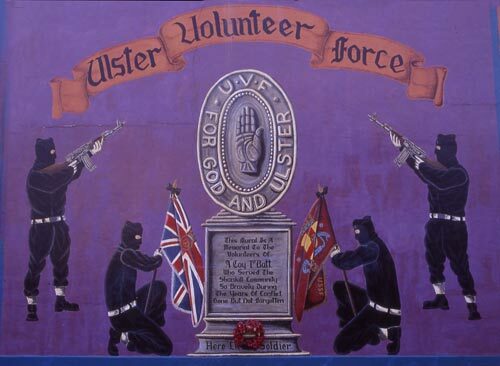 The original UVF was founded in 1912 to fight against Home Rule.